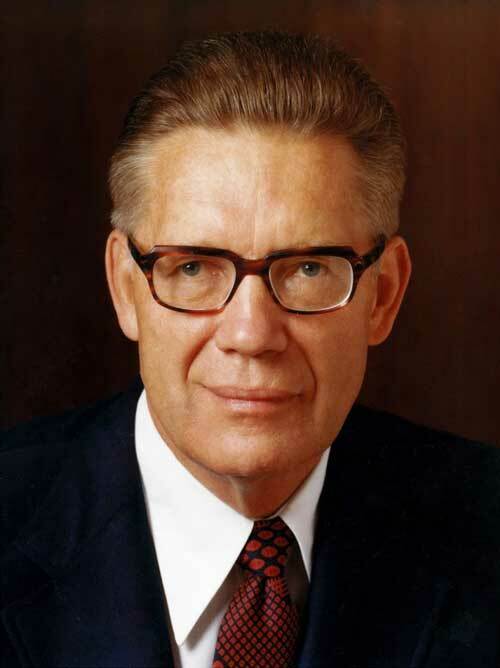 Elder Bruce R. McConkie (July 29, 1915–April 19, 1985) served as a Seventy from 1946-1972 when he was called to the Quorum of Twelve. He served in that assignment until his death from cancer at age 69. "In a real though figurative sense, the book of life is the record of the acts of men as such record is written in their own bodies. It is the record engraven on the very bones, sinews, and flesh of the mortal body. 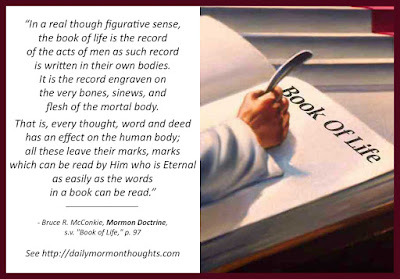 That is, every thought, word and deed has an effect on the human body; all these leave their marks, marks which can be read by Him who is Eternal as easily as the words in a book can be read. 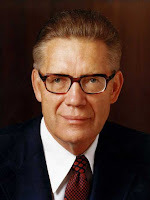 "By obedience to telestial law men obtain telestial bodies; terrestrial law leads to terrestrial bodies; and conformity to celestial law—because this law includes the sanctifying power of the Holy Ghost—results in the creation of a body which is clean, pure, and spotless, a celestial body. (D&C 88:16-32.) When the book of life is opened in the day of judgment (Rev. 20:12-15), men's bodies will show what law they have lived. The Great Judge will then read the record of the book of their lives; the account of their obedience or disobedience will be written in their bodies." These are normally interpreted as physical books, containing a record of good deeds and misdeeds. 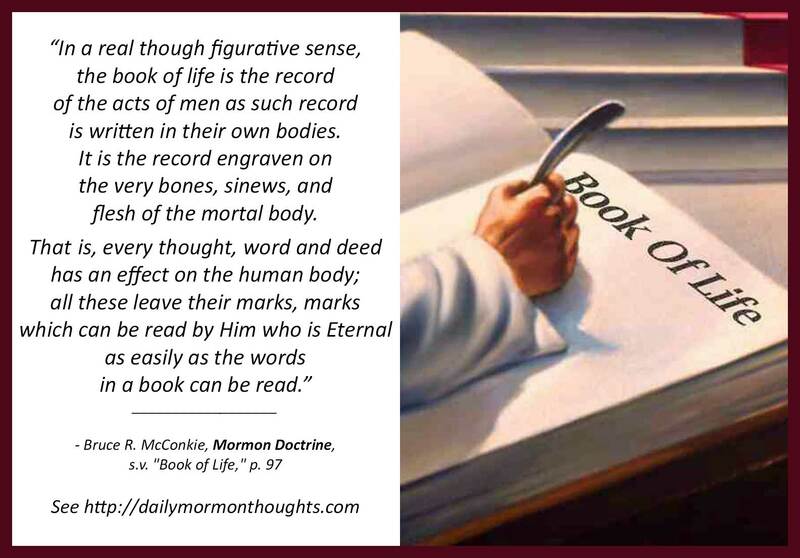 But I like Elder McConkie's suggestion; our very bodies could be considered a "book of life" in recording the impact of our decisions and actions—"every thought, word and deed." Our countenance often reflects more than we realize about those decisions and priorities; and certainly, with the profound and divine insight of "The Great Judge" reading the book, there are many more evidences than we mortals can recognize. Elder McConkie suggests that the very nature of our body changes based on the kind of law we choose to live. Those who follow celestial laws develop and inherit celestial bodies. It's not just a reward at the end of mortality; it's developed throughout mortality. So then in a very real sense, "the account of their obedience or disobedience will be written in their bodies." Interesting to ponder! There is so much more to caring for and developing this body than just the traditional prescriptions and proscriptions of our code of health.